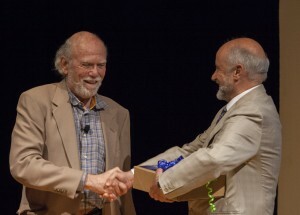 Global Design Effort director Barry Barish handing over the ILC Technical Design Report to Pier Oddone, chair of the International Committee for Future Accelerators on 12 June 2013. Image: Cindy Arnold, Fermilab. The Global Design Effort has completed its mandate to produce a technical design for the ILC. Yesterday’s official handover of the Technical Design Report to the International Committee for Future Accelerators (ICFA) was the culmination of a celebratory three continent event this week. The discovery of a Higgs particle at the LHC at CERN, the production of a viable design for a complementary electron-positron linear collider and the interest of the Japanese in hosting this machine combine to greatly encourage our communities’ hopes and dreams of building the ILC. Over the past 50 years, three generations of particle accelerators have uncovered many of the secrets of particle physics by colliding protons on protons, as a broad-band discovery device, combined with colliding electrons on positrons as a precision probe of the physics. Through research using these complementary colliders, we have made a plethora of discoveries about the basic constituents of matter and fundamental symmetries in nature. The International Linear Collider represents our plan to build an electron-positron collider complementary to the Large Hadron Collider (LHC) at CERN. The ILC will make possible precision studies of the underlying physics of the Higgs, as well as provide a different way of discovering the physics of this new energy regime. Developing such a companion electron-positron machine presents an extraordinary challenge. Electrons and positrons are 2,000 times lighter than a proton and, consequently, at high energies they radiate away much of their energy when bent around a circular orbit in a traditional collider. In fact, the LEP accelerator was limited by such radiation and a new approach is needed to reach the higher energy scale being explored by the LHC. This goal has stimulated the development of linear colliders, consisting of two linear accelerators, one for electrons and the other for positrons, aimed to collide their particle beams with each other. The linear collider scheme solves the radiation problem, but introduces a whole set of new problems that come with a ‘single-pass’ machine. In contrast to having counter-rotating circular colliders where the particles go around the machine multiple times, the beams in a linear collider pass through each accelerating element only once. Therefore, these accelerating elements must be made to be very efficient at transferring energy to the particles. In addition, at the collision point the beams also cross each other only once so that very dense particle bunches must be produced to achieve the needed collision probability. Ambitious R&D programmes were carried out towards a linear collider in the 1990s, especially at SLAC and KEK on room temperature technologies and at DESY on superconducting technologies, and they successfully demonstrated the viability of both technologies. ICFA then took on the role of defining the physics goals and choosing the technology (superconducting radiofrequency cavities) to be the basis for the design of the linear collider. ICFA formed the Global Design Effort (GDE) and appointed me as director in 2005 to lead the enabling R&D programme and accelerator design effort. We then formed a truly global collaboration with the ultimate goal to develop and document a technical design for a future collider project. That step has now been accomplished! The GDE presented the five-volume TDR to ICFA at the worldwide event this week. The ILC TDR design has been thoroughly reviewed for the technologies, the accelerator design and the cost estimates. We now have a design that will be used as the basis of proposals to governments to build the next great particle accelerator. The Global Design Effort has in itself been a rather unique ‘experiment.’ The GDE was formed as a global collaboration, having no central or lead laboratory. To succeed we needed very good support and oversight for a programme distributed among high-energy laboratories around the world. We received consistent scientific and technical guidance from ICFA and its subcommittees, and similarly, management and financial guidance from the FALC. FALC also provided a small common fund that has been used to administer and run the collaboration and to develop a set of joint tools, like a document and data management systems. 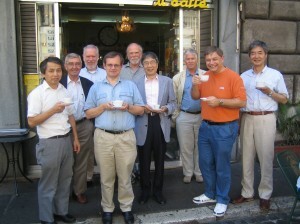 The executive committee in 2007 (getting a shot of good Italian coffee). But, the real success of the GDE has been due to the pooled talents, dedication and hard work of the teams of accelerator and particle physicists who dedicated themselves to this project. They are the authors of the TDR. I thank them all, but today I particularly want to note and thank the GDE Executive Committee (EC), which served with me from the beginning as the leadership of the GDE. This dedicated group has met via teleconferences once per week for the past eight years with near perfect attendance, and in addition, has met face to face all around the world every couple of months to carry out the distributed business of the GDE. This EC has had great stability and, amazingly, has made numerous important and sometimes controversial decisions on technical issues, collaboration policies and strategic questions, without once taking a formal vote! I believe I speak for all of us in saying we are very proud of what we have accomplished and have documented in the TDR and handed over to ICFA. But, what really will matter in the end is turning this design into a real accelerator project. We are now passing the baton on to Lyn Evans and his Linear Collider Collaboration (LCC), which has both new leadership and substantial continuity. I wish them well and am confident that this group, working in concert with the Japanese, will be able to take the next big step towards making the linear collider a reality. Note from the editors: More about the ILC history and its people in Global Design Efficiency – the story of a group revolution. You can add your own memories here!